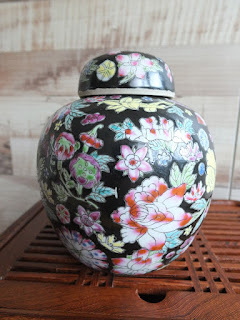 This decoration style on porcelain you see in the above pix is called "Black Million Flower". This porcelain is highly regarded in a few Malaysian tea circles. These drinkers found that using these cups to drink tea make the tea taste better. One Malaysian tea drinker attest to the tea being 'more mellow and more body' and the black million flower cups performed better than his 'Ming dynasty cups'. The "black million flower" porcelain shown in the pix was made in Jingdezhen, China during the late 80s/early 90s. The various flower designs were hand painted with vibrant colors on a black background. I noticed that the larger peony flowers are reminisent of the style used for Peranakan or Nonya porcelain made before World War 2. The interior of these cups are not decorated. I managed to lay my hands on some of these porcelain and you will noticed from the pix that I had got these tea ware in their original factory packed condition. A dozen teacups were wrapped with paper and further protected by a roll of cardboard paper. I got a pair of tea caddies as well. These pretty 8 inch high tea caddies were packed in a pair and came in a box as seen in the 8th pix. Does tea taste better in these cups? I found that most of the teacups produced during the 80s and early 90s do help enhance a tea drinking session in terms of aesthetics and age of the teacups. Many tea drinkers I know, believe teacups made during this period does make the tea 'smoother'. Tomorrow (8 Feb) is Chinese New Year. This will be the year of the monkey. People born in the monkey year are supposed to be intelligent with good sociable skills. Readers, go google the Chinese zodiac and see, for the fun of it, which 'animal' characteristics you may have. Chinese tea collectors will be happy to see their tea collection as being one year older. This is especially important if your tea collection is mainly puerh or traditional oolong. Some teashops may increase the price of their pu erh in their shops as their tea is now 'older'. However, due to the economic slowdown in many developed countries, I do not foresee any serious price appreciation of tea prices in general. There is a strong possibility that you may get your tea at a cheaper price as overall demand may fall due to reduced speculation. I sensed a more thrifty or 'belt tightening' spending pattern by the general public. Terms like 'seeking additional strategic alternatives' (aka company for sale) and 'restructuring' (downsizing) should be a common theme in the business news for the next few months. I enjoy Chinese New Year in Singapore. Most business will be closed for 2 days during this festive period and many people usually take this super long weekend break to be with family, visiting relatives, have some rest and chill out. A nice break for everyone and a good excuse for me to drink more tea. With the prospects of cheaper tea in the year of the monkey, the very interesting US presidential election, a more curvy Barbie…..what more can a tea drinker ask for? To my readers, I wish you a Happy New Year. Live long and prosper. Time for a rare midnight tea. This is the 2003 Xiaguan Tea Factory iron cake. I had purchased a few of these cakes during one of my Malaysian trips in December last year. This 2003 iron cake was a much discussed cake in the Chinese tea forums in China. I supposed this cake had already 'aged' for more than a decade and I guessed a few collectors had taken the cake out, brewed the tea and made notes. 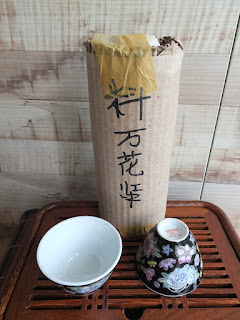 I had my first samplings of this tea last year in Guangzhou (link) and had found that the tea had nice flavors. When I saw these cakes in Malaysia, I bought a few cakes thinking that Malaysian storage of this tea cake would make the tea more pronounced in terms of taste and aroma. You will noticed from the 4th pix, that the neifei (enclosed leaflet) indicated that this tea was manufactured by Xiaguan. Xiaguan iron cakes, I was told by a retired tea manager who had worked in CNNP tea factory, used technology imported from Russia, to produced this super high compressed cakes. You will have noticed from the above pix that the cakes are disk shaped with tiny spikes on one side of the cake. This spikes were made from the molds used to compressed the cakes. I suppose it would be easier to dislodge the iron cake from the mold after the compression process. These tiny spikes on the cake had helped some buyers to determine the authenticity (there are other things to look for as well) of a Xiaguan iron cake. Some tea buyers told me to rest my palm on the spikes and feel the 'pointy-ness' of these spikes. It seems the fakes are less 'pointy'. Breaking up an iron cake is not easy. Readers, if you are embarking on dismantling an iron cake, please be careful. You would need a tea knife and you may accidentally hurt yourself. A Hong Kong tea expert, Cloud had posted a video on how he opened an iron cake (link). It is a good instructional video. Thank you Cloud! Do check out other Cloud's instructional tea videos as well. My Xiaguan iron cake is still rock hard. Even though, this cake is a Malaysian stored cake, the compression remained very high and showed no signs of an 'easy break'. I usually find the regular shaped pu erh tea cakes easier to break open especially if the cake had been stored in this part of the world for more than 10 years. Yes, I use a tea knife but I still ended up with lots of tea dust, something that I disapprove as these tea dust will affect brewing of this tea as they clogged up a teapot and significantly slowing the pour out of tea from the teapot. This tea, when brewed, has hints of an aged pu erh. Some nice complex hints of dry wood and herbs are present in the aroma. It is very pleasant to drink when hot and this tea can easily make more than 10 good infusions. This tea is smooth and very easy on the throat. However, I could still feel a 'newness' in this iron tea cake. There is a edge of rawness in the tea and I could sensed that this tea would be more ready to drink in another 3-5 years. I am sure a few readers would have an iron cake or two in their collection and I suggest maybe for such cakes, that you break maybe a small portion each time (recommend every 2-3 years) and store the rest away. You will get to enjoy this tea while it ages very slowly in your tea cupboard.